Retiring District Attorney Steve Cooley swears his successor Jackie Lacey into office as her husband, David Lacey, looks on, at a private ceremony yesterday at the Clara Shortridge Foltz Criminal Justice Center. 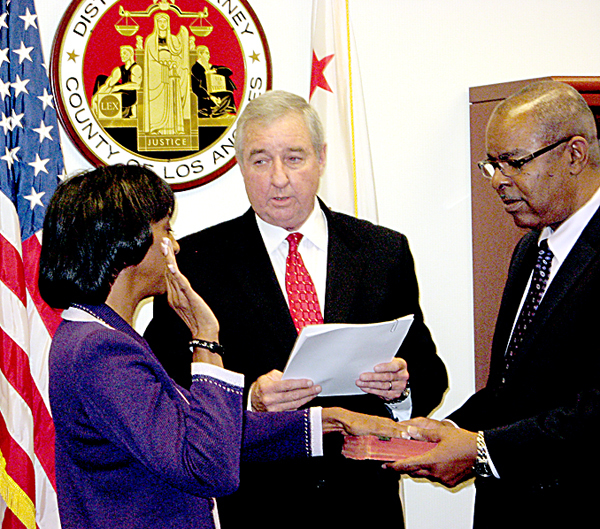 Los Angeles County’s new district attorney took the oath of office yesterday, thanking her predecessor for his backing and citing her career as proof of what hard work can accomplish. Lacey is the first woman and the first African American to hold the office. Steve Cooley, retiring after 12 years as district attorney and another 29 before that as deputy district attorney, formally swore Lacey into office in a private morning ceremony attended by Lacey’s family, friends and supporters at in Lacey’s new office in the Clara Shortridge Foltz Criminal Justice Center. The ceremony opened with a blessing from Lacey’s pastor, the Reverend Alvin Tunstill, Jr., of Trinity Baptist Church. Also present were Lacey’s husband, David Lacey, and the couple’s children, as well as their extended families, friends, and Lacey’s campaign staff, college roommates, and closest supporters. Among those in attendance was Lacey’s mother, Addie Phillips, who said that she was grateful to God and all the people who supported her daughter. She said she knew that Lacey’s father, Louis Phillips, who passed away in 2008, was watching from Heaven and proud of his daughter’s accomplishment. Lacey was gracious in her praise of the people she served with under Cooley, many of whom are continuing in their positions. She noted, however, that she had installed new management, among them Lacey’s new second-in-command, Chief Deputy Sharon Matsumoto, who was present with other members of Lacey’s new staff to congratulate their new boss. When asked whether she was at all nervous about assuming the reins of what the district attorney’s website says is the largest local prosecutorial agency in the nation, Lacey said that the campaign, which lasted 22 months, was far more difficult. The private ceremony was followed by the public swearing-in at Galen Center, during which Lacey received four standing ovations. Lacey attended the university as a law student. She said she applied to USC after having seen it on a regular basis while growing up. The first apartment she and her husband lived in was a studio apartment just down the road. Former district attorneys Robert Philibosian, Gil Garcetti, and John Van de Kamp—who also served as California’s attorney general—joined Lacey for a press conference before the public swearing in, along with Superior Court Presiding Judge Lee Edmon and United States Attorney André Birotte Jr.
Cooley praised Lacey, who served as his chief deputy and whose candidacy he endorsed. “I feel very good about leaving [the office] in good hands,” he said. Lacey said her priorities include the challenge of public safety realignment, the result of a new law under which prisoners have been shifted from state to county incarceration, and on keeping crime rates low. In response to a question about jail overcrowding, she said that the best way to decrease the rate of incarceration was crime prevention and pointed to a program which involves district attorney personnel going into schools beginning at the fourth-grade level. She also promised a focus on preventing high tech crimes and financial scams against seniors. When asked what she plans to do differently than Cooley, she said that she faces different challenges, but shrugged off any suggestion that her predecessor had done less than a stellar job, noting that she was a part of his team. “I’m going to continue to build on what we’ve done,” she said. Lacey said that meeting challenges is her style, but added that she is a collaborator and that her accomplishments represent hard work on the part of a lot of other people. 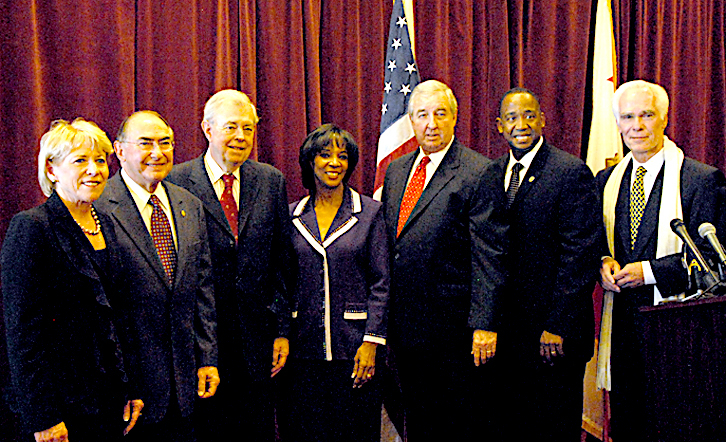 Attending a press conference in connection with yesterday’s swearing-in were Los Angeles Superior Court Presiding Judge Lee Edmon; former District Attorney Robert H. Philibosian, now of counsel to Sheppard Mullin Richter & Hampton; former Attorney General and District Attorney John Van de Kamp, now of counsel to Mayer Brown; District Attorney Jackie Lacey; former District Attorney Steve Cooley; U.S. Attorney André Birotte, Jr. and former District Attorney Gil Garcetti.